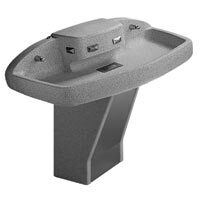 [XPB-MF2944-X] Our Juvenile Terreon Quadra-Fount Washfountain is constructed with a unique, repairable, solid surface material. This hand washing station accomodates one to four users at a time. The bowl and pedestal is constructed of Terreon, a densified solid surface material composed of polyester resin. It's resistant to chemicals, stains, burns and impact. In addition to the bowl and pedestal, the following valves and fittings are standard: Vernatherm™ thermostatic mixing valve, stop/strainer/check valves, flexible stainless steel supply hoses, drain spud and locknut. Stop valves are 1/2" NPT female. This washfountain is ADA compliant and also saves on water, energy, and space. For shipping quotes, orders or questions please call our Customer Service Center at 1-877-483-9270.